Fruit Salad…and Dogs, as it is Thursday. unfortunately that is as far as the creativity has taken me, I have no idea what it wants to become, any ideas? I am knitting like crazy to finish up a pair of socks for my neighbour he hunts and has a house in the country somewhere, so for the past couple of weeks I have been receiving lots of lovely stuff, pears, plums, fig and walnut jam, very yummy, pumpkin and a huge piece of Boar. I have never cooked Boar before and it was fabulous. He didn’t know I knitted socks till he popped over with some stuff, his wife then told me he had been considering buying a pair of hand-knitted socks as he was feeling the cold. So they will make the perfect thank you gift and I know he will really appreciate them, always a plus!! 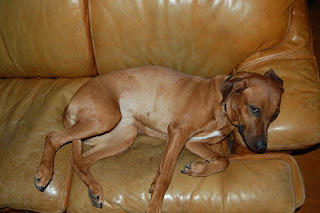 This is Poppy, she is a Rhodesian Ridgeback, she belongs to my friend and Jonah loves her a lot. This is her favourite sleeping place and she must be very sad as my friends recently got rid of this sofa….poor dog!! Oh yes, fruit salad indeed, gorgeous, gorgeous stuff. I would love that colour as some sort of airy scarf, just the thing to brighten up grey days and more sombre winter clothes. How many yards/meters have you got? I agree, some sort of very open lace scarf would be lovely for that yarn, to show off the beads. Poppy has made up for the lack of ex-couch by investing the new(…) one and making my life not worth living by following me around everywhere. Maybe I’ll go & buy it back from Emmaus…..